Food Gallery 32: You’ve Seen the Inside, Now Let’s Eat! In the week and a half since we gave you the first look at the inside of Food Gallery 32, I’ve stopped in over and over again to check out the progress and to sample the food at some of the seven food stalls within. I’m now the FourSquare mayor and was told, ‘see you tomorrow!’ when I left yesterday. The upshot is that I’ve tasted a fair amount of the offerings and ogled some more… you know… for you guys. First, what’s not there. 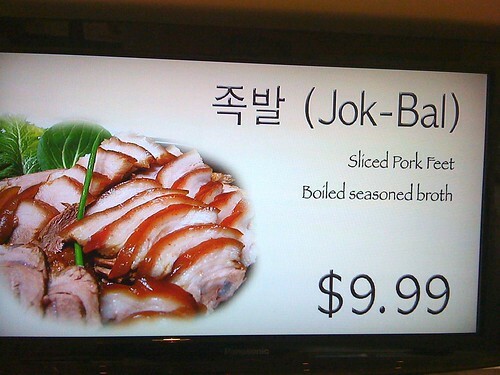 I’ve been hoping to try the jok bal at stall #1, Boon Sik Zip since my first visit to Food Gallery 32 and have been rebuffed every time. Pig’s feet can be hit or miss, so maybe I’m just asking for trouble, but that photo makes me want to try it something awful. Instead, I tried the jjajangmyun at Jin Jja Roo (stall #6), which is quite the mouthful to order. 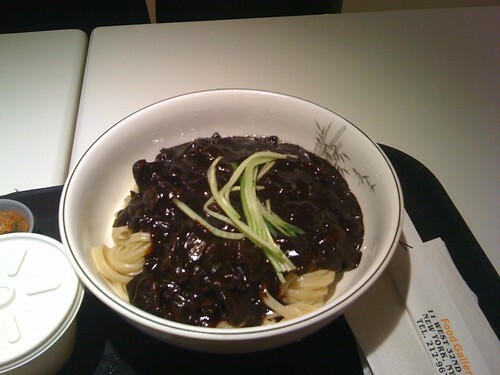 I’d never had jjajangmyun and mostly ordered it because I’ve read some of you guys mention it in the forums. I have no idea what a really good instance is of it (maybe I need to try the version at Hyo Dang Gak? ), but I found this to be decidedly ‘meh.’ For the unfamiliar, the dish is made up of noodles topped with pork in a black bean sauce. The sauce was heavy and a bit goopy, the veggies and pork all looked the same dyed by the black beans and the noodles were chewy. Not a win. Given that this was the day after opening, I’ll definitely give Jin Jja Roo another shot at some point, but probably not for a little while. Right next to them in stall #5, Bian Dang, the former NYC Cravings folks are slinging the same deliciousness we’ve known and loved from the truck. As much as I’ve have liked to have eaten this lovely looking chicken, it was for someone else. Instead I ordered the one new item on their menu, the wonton soup. I ordered the soup as a starter to go with the jjajangmyun – a mistake given how heavy that turned out to be – and the soup came out about 10 minutes earlier. I stood at the stall sipping the broth from the tray here and there. It was great. The salty and savory flavors of the dried shrimp and seaweed were amazing. When I finally sat down, I dug right in, only to be disappointed by the wontons. The wrappers are huge for the tiny pieces of meat inside and they had a similar gummy texture to them like those from Jin Jja Roo. Next time I’m getting the chicken… or maybe a pork chop. Mmmm. A better option is the soup from Big Bowl (stall #7). I had the shrimp tempura udon. This really hit the spot. 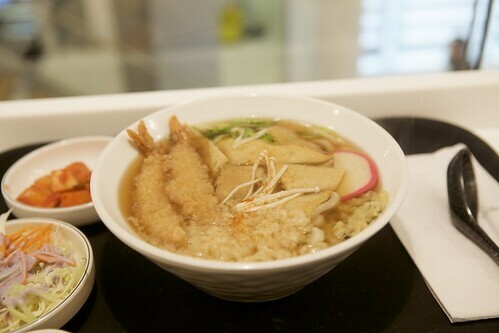 The broth was light, which balanced out the heavy, filling udon. The shrimp were sodden in the soup, so there wasn’t much of a crunch to them, but overall, I enjoyed it. Most recently, I tried the pork cutlets at Pastel (stall #2). I’ve been hoping for some really good katsu in Koreatown ever since Arang closed up for lunch a couple months back. I was happily surprised to see that unlike most other katsu in the area, you get the full butterflied cutlet rather than half. It’s pounded thin, but is still juicy inside. 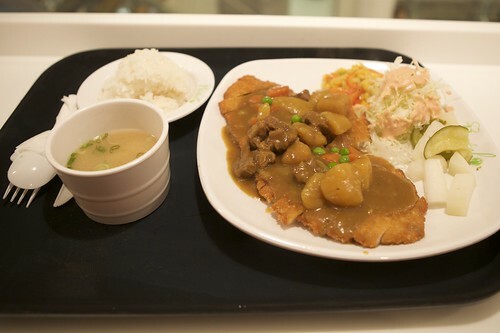 The curry katsu I had was topped with a meat and potato-laden curry sauce similar to what they serve at Arang along with a side of soup, pickles and cole slaw. All of the pork cutlets were priced at $8.95, regardless of the topping, which is nice as most places will charge another buck for it. Overall, Food Gallery 32 is totally a work in progress. I won’t judge the misses I had as anything more than everyone trying to get settled in and find their balance. I will point out that in the last week, the place has been pretty empty, which I doubt will last very long given all the options on hand. I’d recommend stopping in before it starts to draw a crowd. 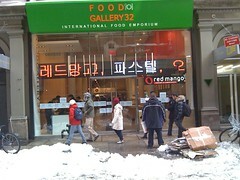 Food Gallery 32, 11 West 32nd Street (btwn 5th + B’way). Posted by ultraclay at 11:45 am, January 5th, 2011 under Food Gallery 32. It seems the only two dishes you liked were not even Korean. I don’t mean to cast dispersion, but are you familiar with Korean food? Jjajangmyun is supposed to be gloopy, but you should be able to taste the pork and zucchini in it. 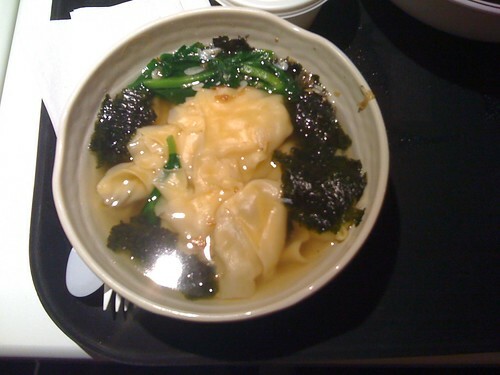 Jjajangmyun is Korean-style Chinese food, so that might be why the soup included wontons. That pork chop looked good, though. Any more details about it? 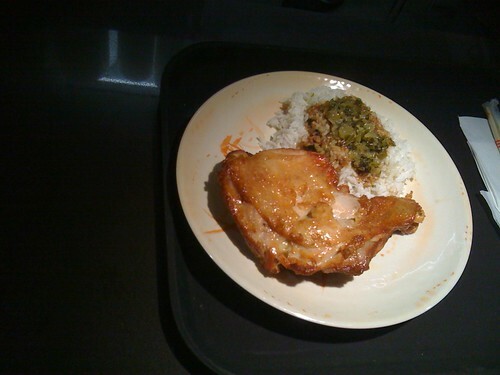 The chicken leg at Bian Dang looks big but the rice and meat sauce portion do not. Oh well. Too bad the jjajangmyun wasn’t WIN but you are in K-town so choices to be had. Hyo Dong Gak for sure!!! is everything available to go? Normally, I love Jjajangmyun, but that version was all right. It didn’t seem to taste like anything. @Steve: yep, everything is available to go, although one vendor complained to me that the folks at the ordering counter had a habit of marking eat-in and takeout options incorrectly, so make sure they take it down correctly. @SMO: I definitely need to try it elsewhere. I walk past Hyo Dong Gak every day, so I definitely need to stop in soon. @Scatologics: cast away, I’m not at all an expert, just hungry. Also, to be clear, the wonton is from Bian Dang, the Taiwanese place formerly known as NYC Cravings, which is also where the chicken is from. 1. Walk inside food court. 2. Walk up to restaurant of choice. Peruse the menu, prominently displayed at the front of each food kiosk. 3. Attempt to order, only to be told by by a very apologetic vendor that we have to turn back around and go to the front to order. 4. Wait in non-existent line or order. Attempt to recall what I ordered while looking at overly complicated price board above POS station to see if I want to get anything extra. But read fast, because the screens refresh pretty quickly. 5. Submit my order. They ask me if I want a drink. So I add two drinks to my order. Then the cashier tells me that I have to turn around and walk across the room to the drink stations so she could ring in my drinks. So i walk across to get my drinks and return to the front of the line. 6. Food is paid for and I receive my buzzer. I proceed to walk upstairs to reserve a seat while waiting for food. 7. Buzzer finally rings after a short wait, so I walk back downstairs to retrieve my food. 8. Walk back upstairs with tray in hand to finally eat. Is it me, or does this entire system seem convoluted? You could literally not think of a more inefficient ordering system. Mind you, this all happened when the place was virtually empty. Imagine the headaches once you start having to deal with a lunchtime rush. How many people are going to walk up to a food counter, only to be told to turn back around and wait in line to ring up their orders? Why does everything have to be paid thru one single line? This system could work efficiently for regulars who know exactly what they want to order, but absolutely counterproductive for new customers who want to sample a little bit of everything. By the way, woorijib across the street was completely packed and the line was flowing..
That isn’t asinine or convoluted, it is utterly retarded. @Scatologics (ET), I personally love the Pork Katsu curry on Japanese row. But curious to see if this one even compares. @jigglypuff: the system definitely needs work, but I’m not sure that there’s space for a cashier at each of the stations. Hopefully they have the menu board worked out better soon because it’ll be a real shitshow once business picks up. I’m going to defend the ordering system. Once this place develops regular customers, these customers will be more than happy to order right away at the front of the house. I also appreciate the centralization. I never liked having to get in multiple lines and pay multiple times at food courts. I’m willing to bet that if/when this place gets popular, the ordering system will prove its worth. @jigglypuff, isn’t it perfectly normal to pick up your bottled beverage before paying? That’s how everyone does it. Unless you’re talking about a fountain drink. I do agree with one thing. They absolutely need to have complete paper menus to distribute at the front. As it stands, you have to walk up to the stalls just so you can read the menus. And I agree with jigglypuff that you shouldn’t have to memorize what you are ordering before getting in line. The Flushing Mall Food Court has the same system: using one cashier for multiple vendors. The system works, even with the crowds. There are a few vendors (mostly to the left of the food court) which don’t use the system. With that said, it definitely is a pain to go to the vendor, check out the menu, and go then order with the cashier (which does not have the menu). @Dan L. It is perfectly normal to pick up bottled beverages prior to ordering. But then again, it is also perfectly normal to have your food on your tray prior to paying in most food court or cafeteria settings. I’m not a fan of the inconsistency. Of course, you could just place the drink coolers next to the cash registers instead of across from. this place reminds me exactly of the food court at Incheon International Airport (seoul’s airport): same ordering system, same selection of different subgenres of popular korean food (with an extra, since chinese food is popular in korea). In fact, if you lumped all of the separate stalls into one restaurant, you would get Kumgangsan (minus Bian Dang). that’s the problem with koreatown in nyc; they are all conglomerated menus and don’t reflect the real culture of eating in korea, where you go to a specific place to eat one particular dish only, and another separate place for something else. this food court is much closer than anything so far. as to the actual dishes and flavors, that’d be another story. I haven’t eaten anything there, but the setup is definitely close to what you’d find in korea. Just got back from trying this place out. There didn’t seem to be much confusion, although I wasn’t there at prime lunch time. My main complaint that others have echoed is that the menu system is overwhelming and confusing. I went with Bian Dang’s chicken because I knew it was a safe bet, but all of the vendors seriously need paper menus. For some reason my brain can’t process reading off those screens.